Welcome to Possession Point Charters! Get ready for a fun and exciting day fishing on Washington's beautiful Puget Sound! Possession Point Fishing is the premiere fishing charter for guided deep sea fishing trips in the Seattle area. Come join Captain Dave Morgison for a morning or day fishing adventure! Bring the kids and build memories that will last a lifetime! Fishing out of the Port of Everett Marina in Everett Washington (25 miles north of Seattle), Possession Point Fishing has been in operation for 25 years and operates one of the safest and most reliable boats on the Puget Sound. Captain Dave is a member of the Charter Boat Association of Puget Sound (CAPS) and is a U.S. Coast Guard (USCG) licensed skipper, so you can rest assured that your fishing trip will be safe and fun for all ages! To get your fishing trip started, contact us and make a reservation today! 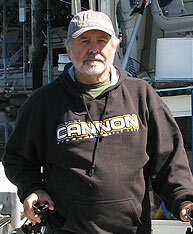 Captain Dave has been fishing the Puget Sound since 1970 and has over 25 years of sport fishing charter experience. His knowledge of local waters around Everett and Seattle is exceptional, and he knows both the well-known and not so well-known hot fishing spots. Come aboard the F/V Valerie Jo for a wonderful fishing trip on the Puget Sound! Our goal is to provide you with the safest and most enjoyable fishing experience possible! On a trip with Possession Point Fishing, you can catch Chinook (King), Silver (Coho), Humpy (Pink) Salmon, Chum, Bottom Fish, and more. We fish all of the great fishing spots including Area 8-1, Area 8-2, Area 9, Area 10, Northeast Kitsap Peninsula, Whidbey Island, Hat Island, and Camano Island! See the Fishing Seasons page to find out what fish are open. We fish year-round!